Thrums: Heading South for the Winter ? Heading South for the Winter ? I agreed to a weaving commission to revisit an old favourite pattern again. 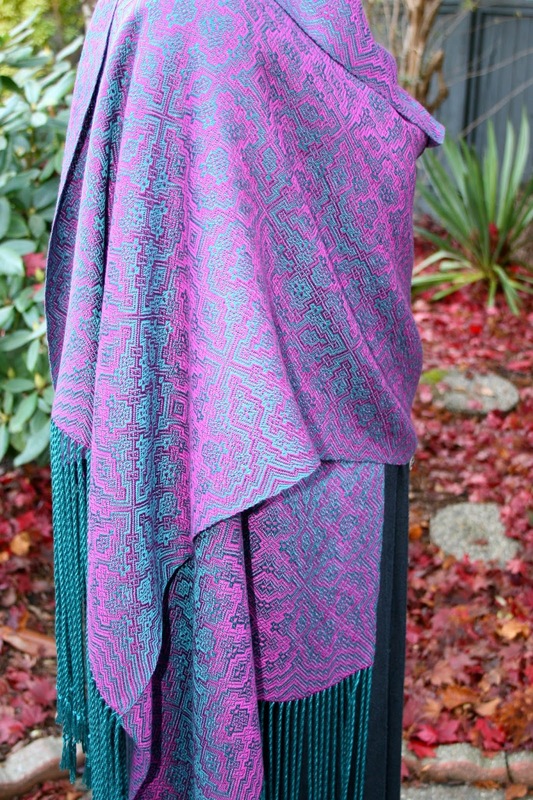 My client was agreeable to all my conditions and in fact, she made only one request and that was the warp be the dark teal this time and magenta be the weft. 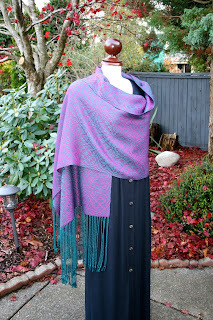 The shawl would look the same as the one woven a few years ago, but the fringe would be teal. I got her request about a week after Webs had concluded their annual tencel sale, and they had NO stock left. Ah, bad timing..... but I worked up an order and placed it anyway so that once more stock arrived it would be shipped first thing. Normally they are out of stock only 2-3 weeks. Roll the clock ahead three months and I decided to call Webs to see when it was likely to be filled. They had some new stock but were holding up my order waiting for a cone of ecru coloured tencel. I chopped it from the order and asked them to ship asap. It finally arrived! Oops, cancel the party..... they only shipped one cone of dark teal when I needed two, and I'm certain I ordered two. The dark teal was the whole main point of the order! So my planned two shawls is now reduced to one and I'm hoping the one cone will be enough. As luck would have it, there was probably about two to three ounces left on the cone when I was done winding. Cutting things really close! It was beamed onto the loom and once the 12 shaft tie up was finally in place, I got things underway. The pattern repeat is quite long and is in fact almost six and a half inches in length, but you don't notice it all that much as you throw the shuttle. You are caught up counting and watching the pattern grow. Its so pretty! Its much like snowflake twill in some ways as its another draft I never get tired of! 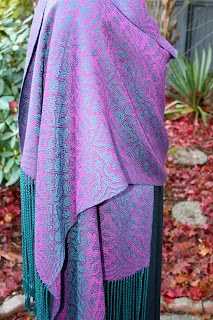 Weaving went well and as for the length, I had to somehow time it to end with the end of a pattern repeat so to balance at either ends of the shawl. By my reckoning I wove it to 90 inches. Yes a bit long but its length what the client wanted. But off loom it measured 85 inches. I double checked my notes where I keep track of my weaving measurements and it seems I made a five inch error.... oops! So it was actually woven to 85 inches which is still nice and long. Then it had the fringes twisted and then into the laundry tub for its hand wash and lay flat to dry. It now measures (after being steam pressed and ironed) 80 inches in length. I can only assume that it relaxed and took up more length, then shrunk again with the hand washing.... but five inches is a lot! The width went from 23 inches on the loom to 21 inches finished. All things considered, it still a beautiful shawl but not the length the client asked for. 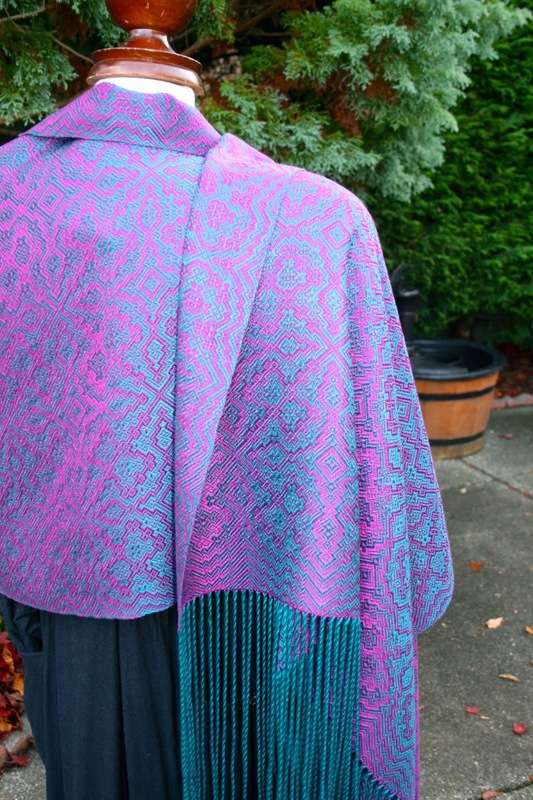 Now if I had been able to weave a second shawl I would have had a choice and been able to give her the longer of the two. So it came back again to my shorted yarn order....... Plus my addition goof! 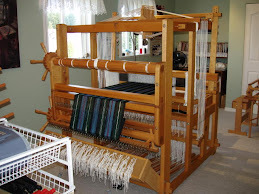 But in my defence, I had very little warp left and couldn't have woven another full repeat anyhow. My client lives in California which is literally burning up right now and I haven't heard from her. 🙁 I do hope she is okay. 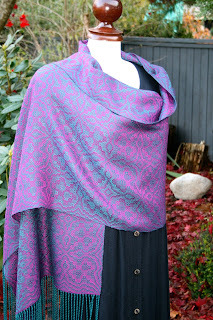 Meanwhile I have hung the shawl up and it will wait till we hear some news. On the personal front: About two weeks ago hubby asked me if I knew how old our hot water tank is? He couldn't find a date on it any where. No idea! I mentally made a note to dig out the house inspection report from two years ago..... and promptly forgot. Last Thursday I woke early and decided to get up and went straight into the shower. Normally I have a coffee first and check my email, but not this day. Hubby went out to the garage to get something from our pantry cupboard out there and discovered a puddle of water and an over flowing hot water tank! Nothing too large fortunately and a bucket and mop soon had it cleaned up. As luck would have it, we had a plumber coming that day to repair an outside hose bib and indoor shut off valve that wasn't fully closing off ahead of the coming freezing weather.... in short a "small job". I called and informed them we now had a "big job" and they arrived that afternoon with a new tank and set about installing it. Installation took approx three hours due to reworking of gas pipes and such but we had hot water and lots of it before the afternoon was done. We haven't seen the bill as yet but we know its best to view it sitting down first. So, we are giving each other a hot water tank for Christmas! Its that special? I bet you haven't got one tucked under the tree. Our best wishes to Van Isle Plumbing for sorting things out in a timely manner! The title of your post confused me......I thought you were headed south! Why don’t you buy tencel from Brassard? They really have lovely tencel and bamboo. I actually prefer the Webs tencel for their colour range. I have tried ( and own) Brassards tencel and bamboo and I do like their bamboo! Sorry for the late reply.... seems Blogger turned off my notifications for comments!